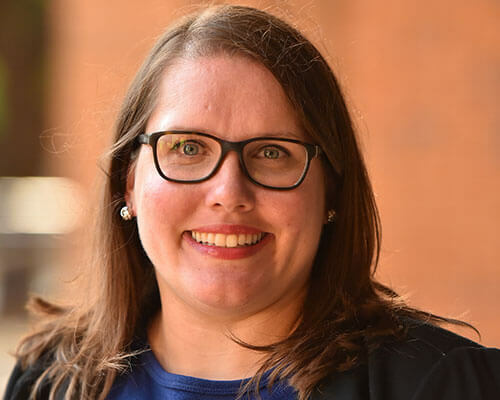 Home » Academics » Schools » College of Arts, Humanities and Social Sciences » Faculty » Lindsey Passenger Wieck, Ph.D.
Lindsey Wieck joined St. Mary’s University in 2017 as the director of the Master of Arts in Public History program. She received her Ph.D. in American History from the University of Notre Dame in May 2016 and was a postdoctoral fellow there for 2016-2017. While doing her research, Wieck grew excited by the possibilities to integrate GIS, text analysis, and data visualizations into her work on Latino community formation and gentrification in the Mission District of San Francisco. She also specializes in the history of the American West, race and ethnicity, and American cities. She enjoys incorporating digital technologies in her teaching and also emphasizes digital writing and communication in her courses. “Upholding Culture and Language in Guadalupe, Arizona: Bilingual Education Activism in the 1970s,” Western Legal History 23 (Winter/Spring 2010): 47-85. The Mission Impossible: The Cultural Politics of Community and Gentrification in Postwar San Francisco. Lindsey Passenger Wieck and Jason Heppler, California Rising: Space, Place, and Community in Northern California, edited collection on San Francisco and Silicon Valley in the postwar era. In early stages with Writers’ Workshop scheduled for October 2018. “Blending Local and Spatial History: Using Carto to Create Maps in the History Classroom,” Blog Post, American Historical Association #DigHist Blog Series, September 25, 2017, http://bit.ly/2hnMrtN. “BART’s Plans for the Mission: Tacos, Towers, and Miniature Vehicles,” Historical Essay, FoundSF.org, October 2016, http://bit.ly/2e9mJpY. “Creating Gay Spaces: Spaces of Social and Sexual Freedom,” Historical Essay, FoundSF.org, October 2016, http://bit.ly/2dM9YCg.